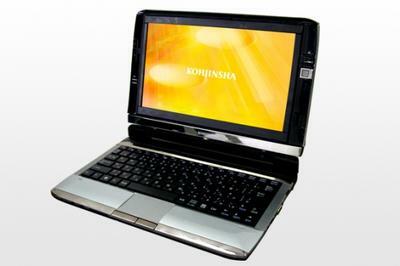 A few weeks back Kohjinsha surprised the tech world by the speed in which it made its dual-screen laptop, the DZ, available after first showing it off at the CEATAC trade show in October. 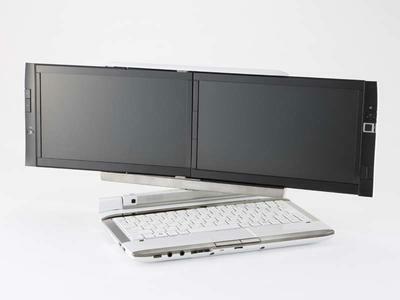 Prior to this, Lenovo’s “screen and a bit” ThinkPad W700ds was the nearest thing we had to the massive workspace potential offered by two screens, unless you count the lots-of-promises-but-no-actual-product goings on at gScreen. The DZ sports two 1024 x 600 resolution 10.1 inch backlit screens powered by an AMD Athlon Neo MV-40 1.6 GHz chip and ATI Radeon HD3200 graphics processor combination. Fingerprint access control, integrated webcam, 160Gb hard disk drive and HD audio packaged with a splattering of useful software, including Windows 7 Home Premium, set this innovative piece of kit on its own technology pedestal. That is until Onkyo jumped on the bandwagon. Although basically the same model, Onkyo’s DX has raised the stakes somewhat by giving it a screen resolution upgrade, a base memory increase to 2Gb and treating the hard disk to double the capacity at 320Gb. Of course, both machines are only available to Western markets via specialist importers at the moment but the floodgates have been well and truly opened. But will anyone actually find a two-screened portable computer useful? For business purposes the answer is a resounding yes. 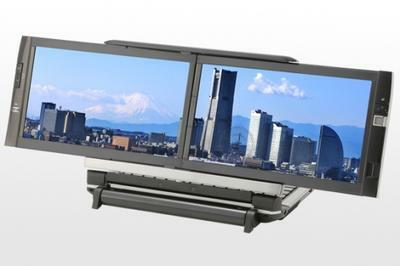 Desktop PCs running multiple displays have become almost common in the workplace of stock traders, graphic designers, draftsmen, media publishers, developers and so on. Having used such a setup myself I can testify to the huge potential for increased productivity and the enormous benefit of being able to expand a huge spreadsheet across two screens or having an image or video on one screen and all the editing and manipulation tools on the other. Relatively recently, the world of business has seen a shift towards a more mobile workforce and until the advent of the dual-screen laptop, the businessperson-on-the-move has had to make do with limited workspace real estate. Happily this is no longer the case. No doubt an obvious market for such a laptop is the gaming world. Imagine carrying around a gaming machine capable of rendering multiple screen views of the gamespace or even allowing users to have TV or media running on one display while gameplay is being enjoyed on the other. Sort of a grown-up Nintendo DS, if you will. And what about the internet-obsessed multimedia junkie? Being able to surf the web, watch a movie, stream the news, video chat with friends and family or play music videos all at the same time offers its own special appeal. I think the dual-screen laptop likely to become a must-have gadget in the next few months and will certainly be adding one to my personal wishlist. Would you benefit from all the extra screen space offered by having two screens on a laptop or do you think it all a bit gimmicky?